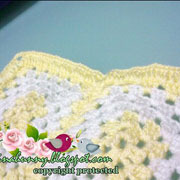 I’m proud to present more photos that were submitted by Crochet Spot readers! You all have done such a great job and I’m always blown away to see your awesome work. I hope everyone enjoys the round up! Feel free to comment on everyone’s work. 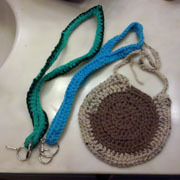 If you’d like to share your crochet work in a future roundup you can submit your crochet pictures! 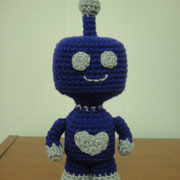 Trixie made the Amigurumi Robot in a nice blue. 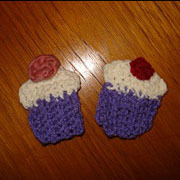 MissHSoo crocheted 2 cupcake appliques. 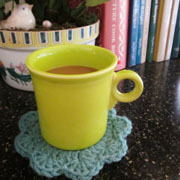 Angie uses the Cool Coasters #1 crochet pattern. Marina crocheted a granny square blanket. Amber adds a strap to her Kiss Me Bag. 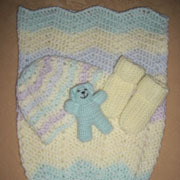 Di adds the Super Simple Baby Socks to her set. 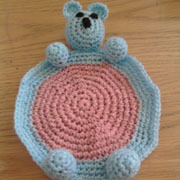 Di crochets a Teddy Bear Coaster. 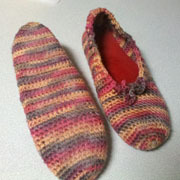 Rayna dresses up her Easy Adjustable Slippers. 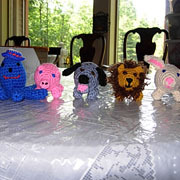 Cherie creates animals using the egg pattern as the body. 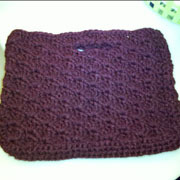 Renee creates the popular Kiss Me Bag in purple. Renee made a baby bib and a set of lanyards. Melanie attaches the pig applique to a headband. 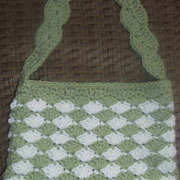 Have you crocheted something you’re proud of using a Crochet Spot pattern? Feel free to submit your crochet pictures to be included in a photo roundup! This entry was posted on Wednesday, June 29th, 2011 at 12:16 PM by Rachel Choi	and is filed under News. You can follow any responses to this entry through the RSS 2.0 feed. You can leave a response, or trackback from your own site. I love the kiss me bags, especially the one with the handle. I really should make one. The coaster is very nice too, and the animals with the egg patterns are so creative. I think is the best roundup yet! 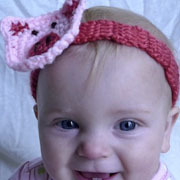 i love the pig applique on the baby headband…that is tooooo cute!!! What a creative bunch we are! Thanks to Rachel for doing the photo roundups. It is great fun, and very inspirational, to see what others are doing – especially the ways people have modified the patterns to create something new. tq rachel..my photo was published! so excited! I love the photo roundup, it is great to see the modifications people make and very inspirational. I think all of the projects are beautiful. great! So fun to see all the projects. hi,the photo round is great and inspires me so much! made a cute evening bag! !